UPDATED: APR 19, 2019 Very strong grapefruit notes off the cuff. Taste backs this up with delectable fruitiness and grapefruit notes to boot. Delicious. UPDATED: MAR 25, 2019 Découverte en cannette 33cl, bière qui n'est pas du tout mon style avec ses arômes de pale ale assez amers. Très certainement une bière agréable, mais pas mon dada. UPDATED: MAR 19, 2019 Can at Dirty Onion Belfast. Lightly hazy gold with decent sized white head. Nose is grapefruit and some grassy hops. Decent balance as it doesn’t taste like drinking fruit juice. 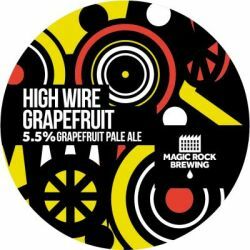 Grapefruit for sure but not overly so. Some lemony citrus, grass and bubblegum. UPDATED: MAR 6, 2019 Very much grapefruit at the fore as you’d expect. Bit of tartness to the taste. Some bitterness coming though. Pretty good. UPDATED: FEB 9, 2019 Uit een blikje in Hof van Saksen. Gouden kleur, heel klein beetje troebel, mooi wit schuim. Een prima frisse smaak. Veel citrus inderdaad, maar ook zoet en bitter. Erg lekker fris bier, ik vermoed in de zomer nog beter tot zijn recht komend. UPDATED: FEB 5, 2019 Can. Malty and hoppy aroma, citrus fruit, dominant grapefruit. Tastes the same as aroma, medium bitter. Light to medium body, hoppy grapefruit bitter finish. Good. UPDATED: JAN 13, 2019 0,33l can. Pours cloudy golden with white head. Aroma of grapefruit, lemon, tangerine peel, orange, some tropical fruits. Taste is massive citrus (all kinds, tangerine peel sticks out the most), extremely refreshing & easy drinking. Light body, high (not too high) carbonation. UPDATED: DEC 9, 2018 Lekki, troszke mdły aromat chmielu i grejpfruta. Z początku wydaje się trochę mydlane. Do West Coast jeszcze niezbyt blisko. Ale dociera -bardzo miły ten grejpfrut - tak w stronę Sweetie. Bardzo ciekawe, bardzo dobre.